In the world of men’s style, jeans are about as iconic as it gets—the perfect combination of versatility and durability. Whether you’re driving a porsche or riding a horse, jeans have the unique ability to rise to any occasion. But when presented with a sea of styles, fits, washes and materials, it can be tough to find the right pair. 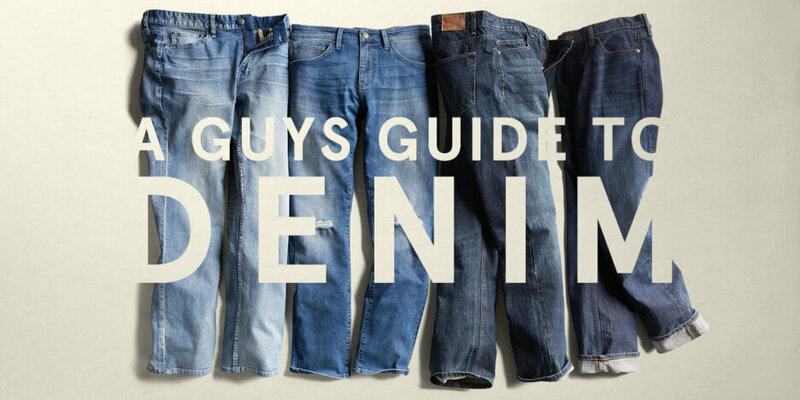 This denim guide is here to help you refine your style and figure out how to wear jeans that are the perfect fit for you. Here’s our simple approach to finding the best jeans for you! 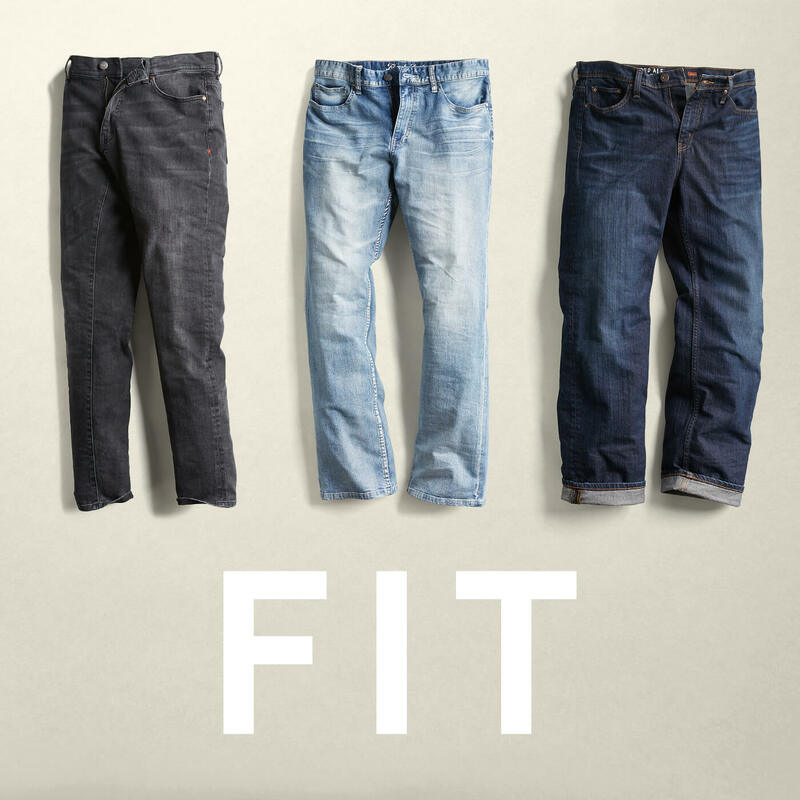 The first question to ask yourself is what style of jeans you can see yourself wearing. This will depend on the overall look you’re going for, as well as your body type (yes, your jeans will depend on your genes). Keep in mind that there are no wrong answers here! Skinny jeans have a snug fit through the seat and thigh and become tapered below the knee with a small leg opening. Skinny jeans will help give you a fashion-forward look. They will look best paired with other trendy items like a pair of fresh white sneakers, solid crewneck sweater, or crisp Oxford shirt. 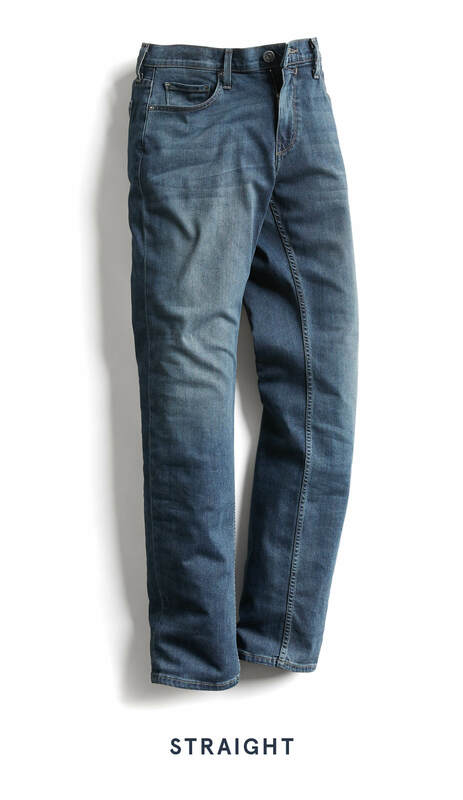 Straight jeans are a bit more relaxed through the thigh, usually with a higher rise, and do not taper past the knee. Straight leg jeans can go with anything—paired with sneakers and a t-shirt or with a tucked in shirt and boat shoes. If you want a style that has stood the test of time and can fit in almost anywhere, this is it. Like straight cut jeans, bootcut jeans have a bit more room in the thigh, but become wider near the ankle and—you guessed it—were designed to fit over boots. As their name suggests, bootcut jeans are very utilitarian and look great over a pair of cowboy or work boots. Since they have a bit of a more laid-back vibe, they go well with flannels, t-shirts, and other workwear. Relaxed jeans are the roomiest option, with plenty of space in the thigh, seat, and below the knee. Relaxed jeans are having a comeback and pair well with other casual, relaxed clothing. Wear them with knit sweaters, flannels, or roomier shirts and feel free to cuff the bottom for some extra style points. When you find the perfect fitting pair of jeans, you may never want to take them off. Whatever style you choose, it’s important to make sure your jeans fit like a glove. Slim fitting jeans are better suited for guys who are on the trimmer side or want to make sure their jeans have a fitted silhouette. Generally, buying slim jeans with a little stretch in the fabric will make them more comfortable and reduce the break-in period. There’s nothing “regular” about this fit—these are your classic jeans that are well-suited for guys who have an average build, like a bit more room to move, or want a fail-safe option to wear with anything. Loose fitting jeans are a comfortable choice that any guy can pull off. Whether you have a bigger frame or prefer a baggier feel, this fit will give you a casual, laid-back look. And like many trends of the ‘90’s, loose fitting jeans are making a comeback. 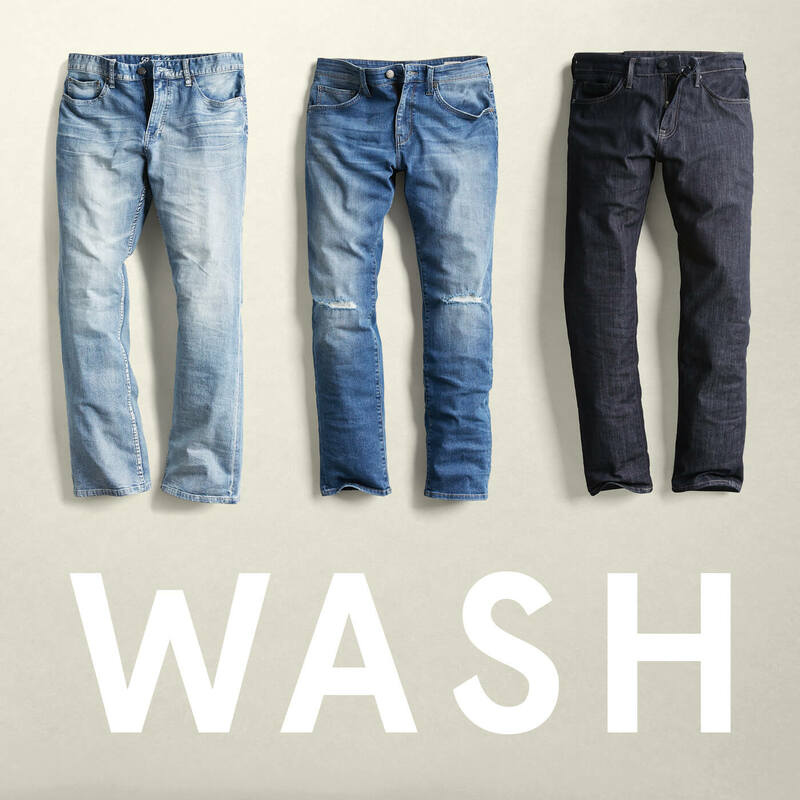 Here’s the fun part: choosing a wash is where you can really add personality to your jeans selection. There are a lot of options, but don’t get blue—we’re about to walk you through the differences of each so you can find your denim soul mate. Generally speaking, jeans with a darker wash are a bit more dressy. They are a safe bet that will look great on any guy and any body type. Plus, they will fade beautifully over time and give you that coveted wallet mark in your back pocket. Just be careful about washing them too often and make sure to read up on proper denim care. 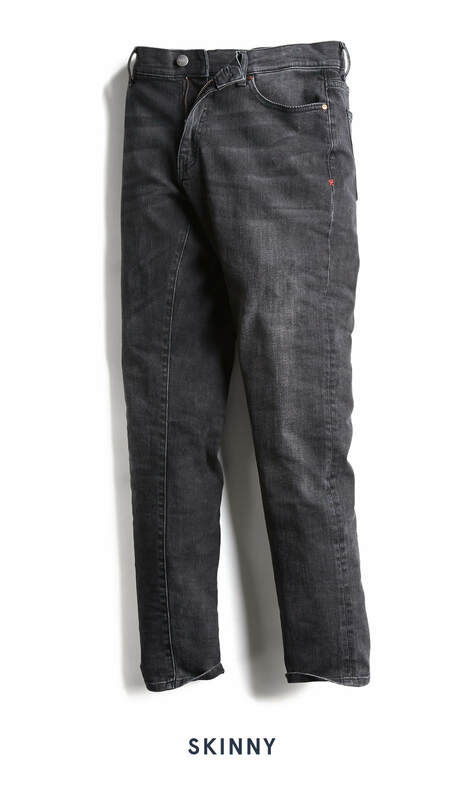 Stylist Tip: Try dressing up a pair of dark wash jeans with a tucked in shirt for your next date or work dinner. 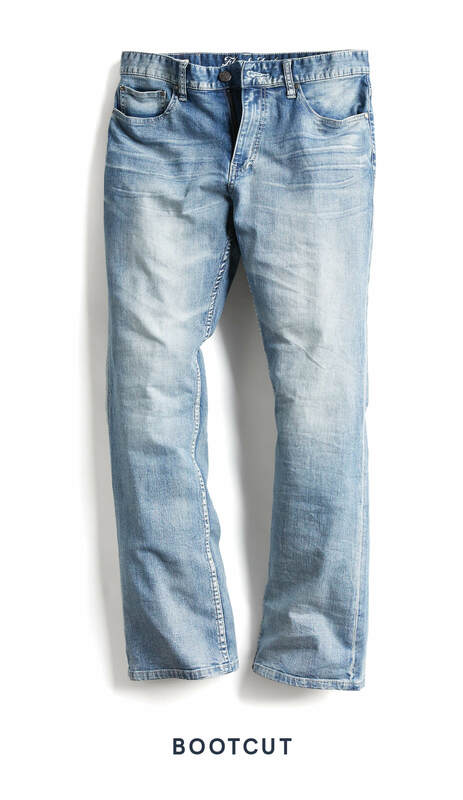 Light and medium wash jeans already look broken in and are great for a more casual outfit. Perfect for those trips to the beach, running errands, or lounging around the house. If you’re feeling bold, opt for a pair of acid wash jeans for a retro-inspired look that will turn heads and make people wonder if they just saw Zack Morris walk by. Stylist Tip: Light and medium wash jeans are best paired with tennis shoes, plain sweaters, and casual t-shirts. A colored pair of jeans can really add another dimension to your denim game. These are a great option for adding a bit of flair to your outfit and can shake up your color patterns so you don’t wind up looking too blue. Stylist Tip: A pair of grey jeans is a safe bet and will go with anything, while a pair of maroon jeans will set you apart from the crowd. Black jeans are sure to give you that desired edge. Whether you’re looking to wear jeans that will work in a dressier setting, or want to add an edgy vibe to your outfit, black jeans are always a good option to have in your arsenal. Stylist Tip: Pair black jeans with a blue jean jacket for a fringe look that doesn’t risk the monochromatic resemblance to a Canadian tuxedo. Raw and selvedge denim are reserved for the most committed denim wearers. Two techniques that are often used together—raw denim refers to the unwashed material that the jeans are made from and selvedge refers to the finished edge on the fabric near the seam, which makes it ideal for cuffing. While they take a bit of effort to wear in, you will be rewarded with a pair of jeans that is truly yours. 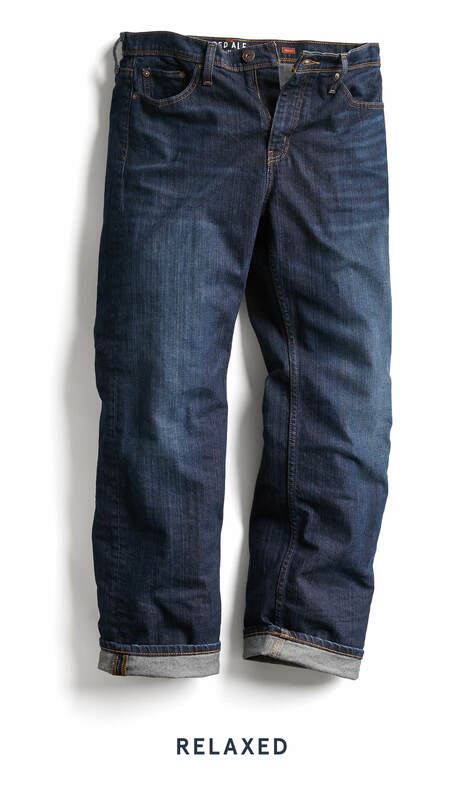 Stylist Tip: Wear raw or selvedge jeans with a pair of workboots and flannel for a ruggedly refined look. Distressed jeans can come in many forms and work well for those wanting a more fashion-forward style. Tread lightly here, you don’t want to buy a pair of jeans that looks like it has gone through the garbage disposal, but a few rips here and there can help you pull off an effortlessly cool look. Stylist Tip: Pair distressed jeans with simple combinations like a white t-shirt or henley. Ready for a new pair of jeans or two? Schedule a Fix & tell us you need new blue jeans.